For Russia and China Iran's accession would be beneficial. Now that international sanctions against Iran have been lifted, there are no legal barriers to the country joining the Shanghai Cooperation Organization (SCO), an international body in which Russia and China play a key role. 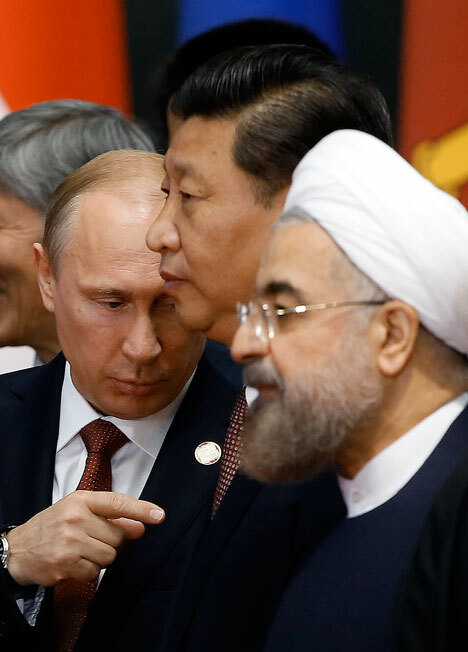 Russian analysts believe Tehran's accession to the SCO would provide additional security guarantees both for other SCO members and for Iran itself, and would also help development of the infrastructure projects important to the Iranian economy. Chinese President Xi Jinping, during his visit to Iran in January, declared China’s support for Iran’s application to join the SCO. In addition to signing 17 trade agreements, worth over $600 billion, with President Hassan Rouhani and announcing a strategic partnership between the two countries, President Xi said, "China supports Iran's application for full membership of the SCO." Russia had already expressed support for the initiative. Foreign Ministry spokesperson Maria Zakharova said, "Russia has consistently supported Iran's full-scale engagement in cooperation with the SCO members and directly with the organization." Iran’s Foreign Ministry also confirmed in January that the country was keen to join the SCO. With the international sanctions against Tehran lifted, there are no legal hurdles to Iran joining the SCO. Orientalist Pyotr Topychkanov, an expert from the Carnegie Moscow Centre's Non-proliferation Programme, believes that no SCO member would say "No" to Iran's application. "For countries in the SCO, primarily Russia and China, Iran's accession would be beneficial, as it would make it possible to fit its foreign policy into the pattern of development of the Eurasian space," Topychkanov told RIR. "The SCO has common obligations, 'red lines' common to all its members, which cannot be crossed. Taking on these obligations will make Iran a more predictable player." Security guarantees are no obstacle to either the SCO or Iran itself. According to Topychkanov, by joining the SCO, the formerly isolated Tehran would become part of its security structure. "For Iran, it is important that, for example, flare-ups that might occur in the Persian Gulf [Iran's current conflict with Saudi Arabia is the context here – RIR] would concern not just it, but the other countries in the SCO as well. This would reduce the risk of such flare-ups." According to Topychkanov, the process of accession of Iran to the SCO may take quite a long time, as the procedure for admitting India and Pakistan into the organisation, which started last summer, is currently in process. "India and Pakistan are now on the way to the SCO, and the accession of these countries will bring a lot of new things: the expansion of the bureaucratic apparatus of SCO, the adoption of a new language, and so on. The organization will need time to "digest" the two states and to modify its structure. It is possible that Iran’s entry will be postponed; at the same time, there is a possibility that the process of adoption of Tehran will be held in parallel with admitting New Delhi and Islamabad into the SCO." Professor Nina Mamedova, Head of the Iran Department at the Institute of Oriental Studies in Moscow, also noted the importance of the Afghan problem for both Tehran and the SCO. "Iran is more interested than anyone in ensuring security in Afghanistan: its Afghan border is one of its most problematic regions." According to Mamedova, Iran's accession to the SCO would allow the organization to "unfreeze" major logistics projects blocked in the mid-2000s because of Iran's isolation from the global economy, particularly the International North-South Transport Corridor, a trade route between India and Scandinavia via Iran and Russia. China is particularly interested in working with Iran. According to Mamedova, Iran is crucial to China's "New Silk Road" project. "The south-east of Iran; a coastal area on the border with Pakistan; and the port of Chabahar in particular, is an important area for maritime trade," said Mamedova. "China is planning to develop a transportation corridor to these regions through Pakistan and Afghanistan, and there are railroads to there from countries in Central Asia." Topychkanov, meanwhile, noted that it would be better for Iran to work with China through the SCO rather than on a bilateral basis. "Clearly, the area brought together by the SCO is currently dominated by Chinese money. But for the member countries it is more convenient to develop projects as part of the regional organization, where there are common agreements and conditions; otherwise they will be too dependent on China," he believes. The SCO comprises Russia, China, Kazakhstan, Kyrgyzstan, Tajikistan and Uzbekistan. In summer 2015, the procedure was set in motion for two new members to join: India and Pakistan. The SCO's key focus areas are; fighting terrorism, extremism and separatism; strengthening security; and developing economic and infrastructure-related cooperation. Iran has had observer status at the SCO since 2005, but while UN Security Council sanctions were in place, the organization’s charter prevented it from applying for full membership.